Around Easter each year you can see the beautiful yellow splashes of colour in our urban bushland as the environmental weed Easter Cassia Senna pendula var. glabrata comes into flower. 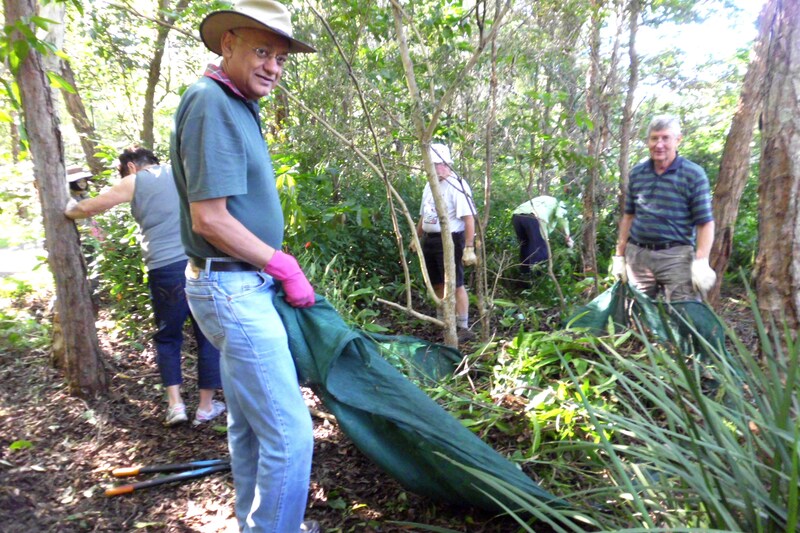 Our last Friday Bushcare at Roly Chapman Bushland Reserve focused on clearing Easter Cassia before another season’s crop of seed matures and spreads the weed further. 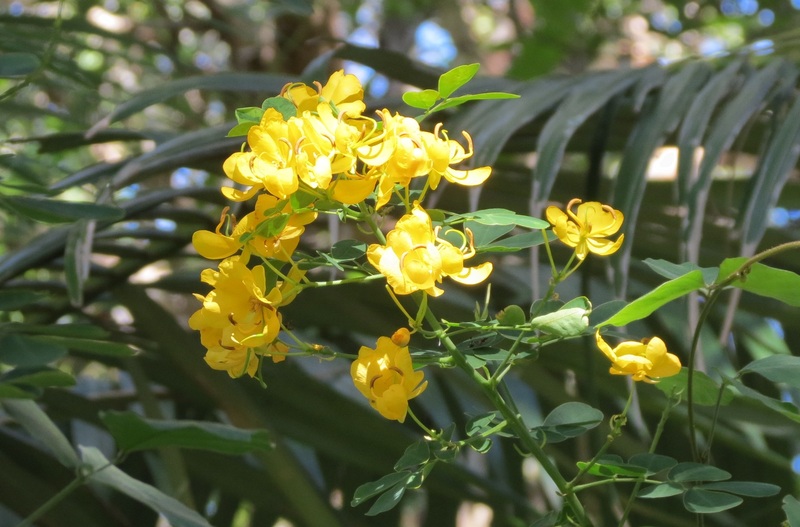 Easter Cassia produces beautiful flowers for much of the year. However, it also produces large numbers of seed pods spreading from gardens into urban bushland and shading out native plant species. You can help protect our bushland by replacing Easter Cassia with native Sennas which have yellow flowers, grow to a similar 2 to 3 metres in height and attract a range of butterflies to your garden. 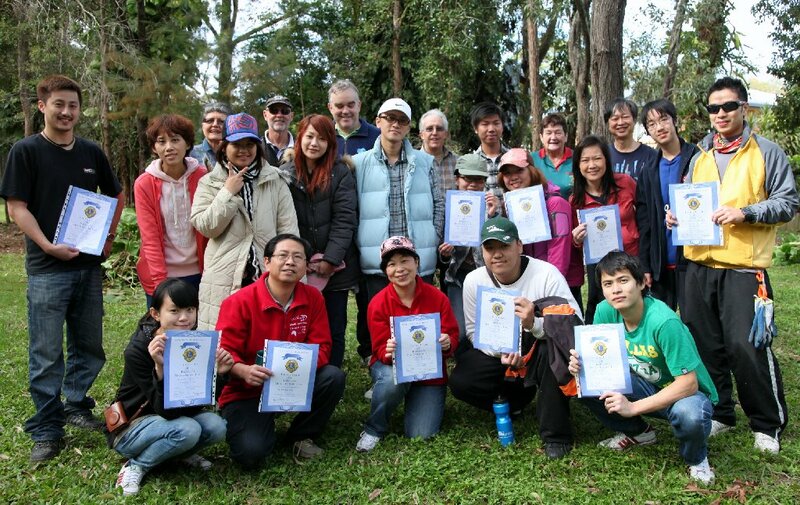 See Toowoomba Plants article on native Sennas and butterflies. 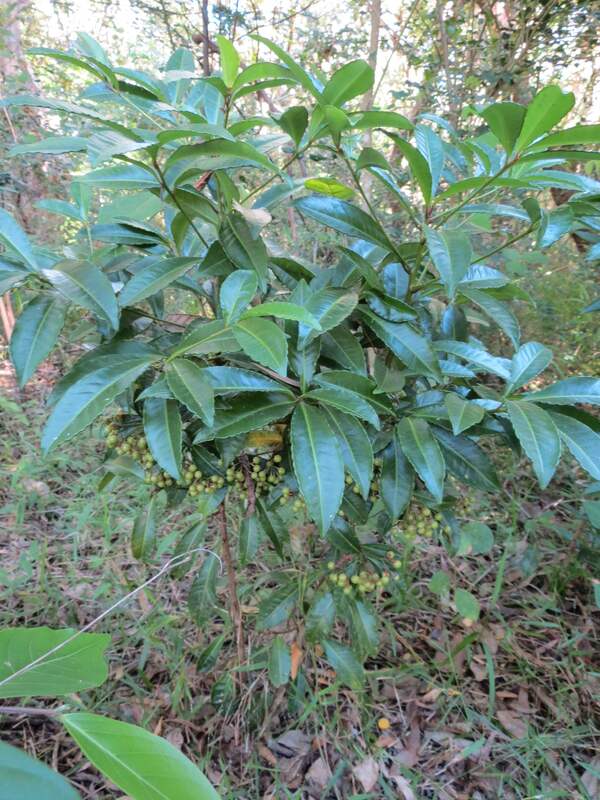 Attractive garden plants like Australian Holly/Christmas Berry Ardisia crenata often become environmental weeds in our urban bushland as they are dumped at garden waste or spread by birds. The moist conditions within Roly Chapman Bushland Reserve make this important habitat particularly vulnerable to invasion by Ardisia crenata. We also used the Treepopper to remove a well established Chinese Elm Celtis sinensis. Another garden escapee that crowds out native plant species vital to our native birds, butterflies and bees. When ever possible we avoid using poison. 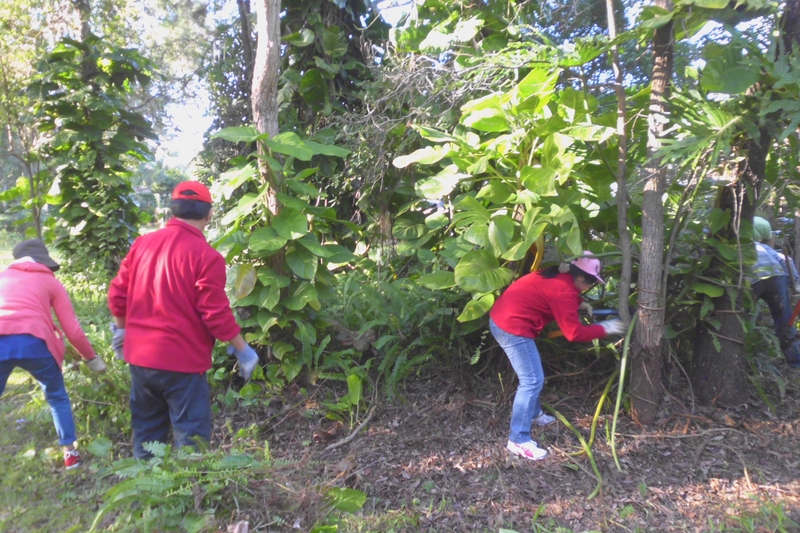 Instead we pull woody weeds up roots and all with the Treepopper. 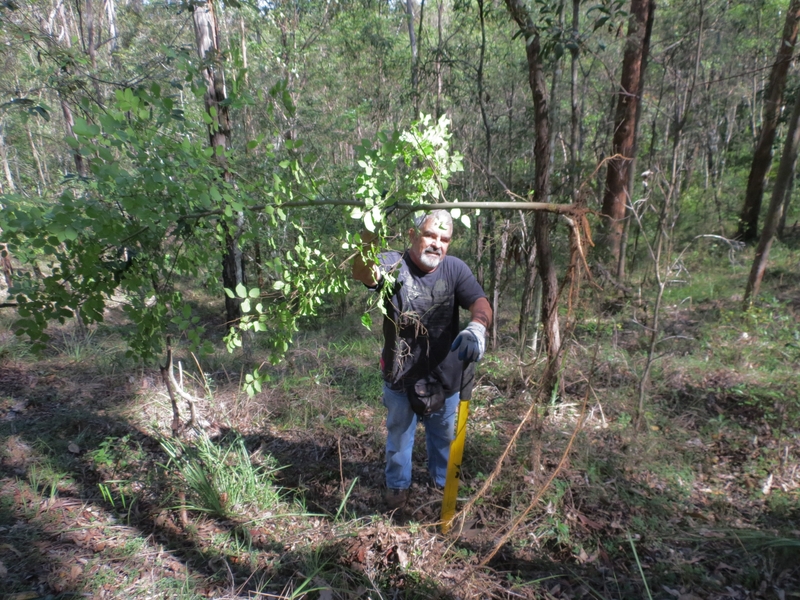 Our bush restoration work is very satisfying as we clear the weeds and watch the regrowth of native habitat. 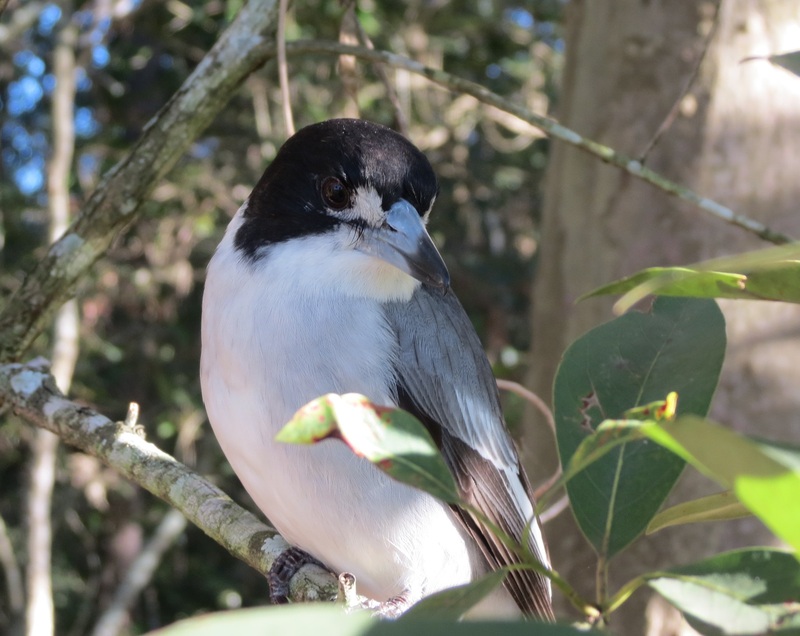 And every Friday as we work we are joined by a family of Grey Butcherbirds Cracticus torquatus looking for breakfast of spiders, centipedes and bush cockroaches. 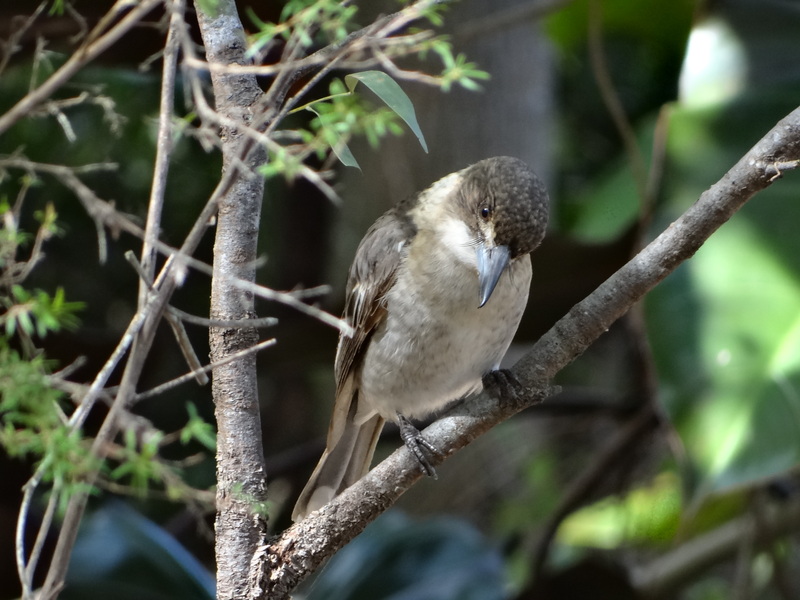 These birds are so used to us now that they will land on a branch right beside you and pose while you take photos or sing cheerful tunes that seem to be thank-you songs. 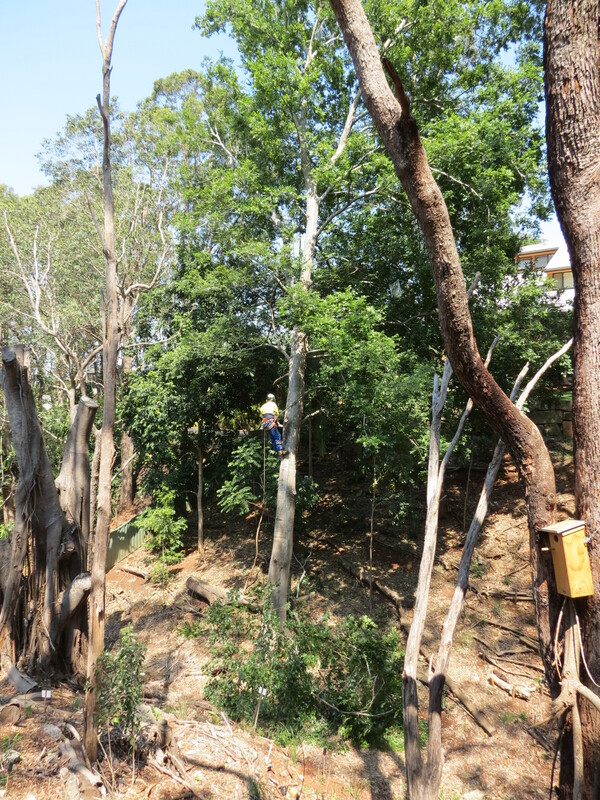 Marshal and I tackled the Chinese Elm Celtis sinensis infestation in Fox Gully Bushcare this morning. Mature Chinese Elms can reach 20 metres in backyard gardens. 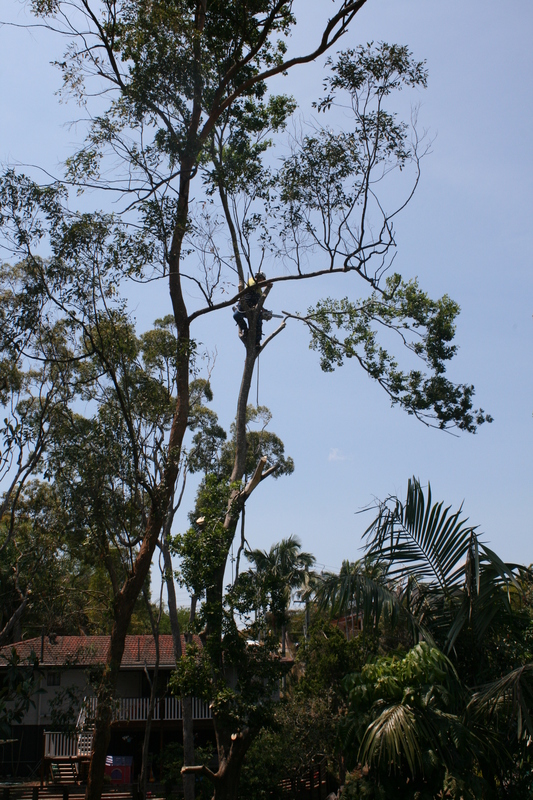 A Tree Popper is the ideal tool for this job allowing us to remove all but six larger Elms without using poison. The largest we removed with the Popper as about twice my height with an extensive spreading root system. In total we removed 40 Chinese Elms, about 30 Umbrella Trees Schefflera actinophylla, dozens of Micky Mouse Plants Ochna serrulata, Camphor Laurels Cinnamomum camphora, Small Leaf Privet Ligustrum sinense and Indian Hawthorne Rhaphiolepis indica. 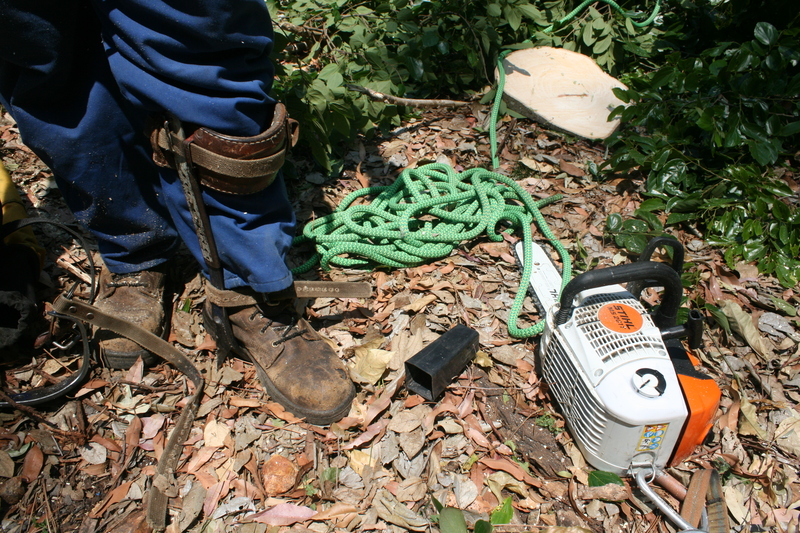 The Tree Popper is perfect for use in safely and easily removing these woody weeds in bush restoration sites. The jaws of the Popper clamp around the trunk and the long handle provides leverage to pull the weed roots and all. The Popper is particularly useful for tackling the deep-rooted Micky Mouse Plant. Using Cyclone 2-Prong Hoe we also removed two garbage bags of Asparagus Fern Asparagus aethiopicus and Climbing Asparagus Fern Asparagus plumosus. The long handle and sharp prongs of the 2-Prong Hoe reach past the prickly leaves and the prongs get right under the crown of the plant allowing the complete weed mat to be removed quickly and easily. After inspecting Fox Gully Bushcare site Zone 10, I yesterday removed 53 small and 6 large mature Umbrella Trees Schefflera actinophylla. A similar infestation in Zone 11 will be removed this week. I also removed a number of Camphor Laurel Cinnamomum camphora and Chinese Elm Celtis sinensis trees, as well as, Creeping Lantana Lantana montevidenses. These environmental weeds are all spread by seeds being eaten by birds and other animals. 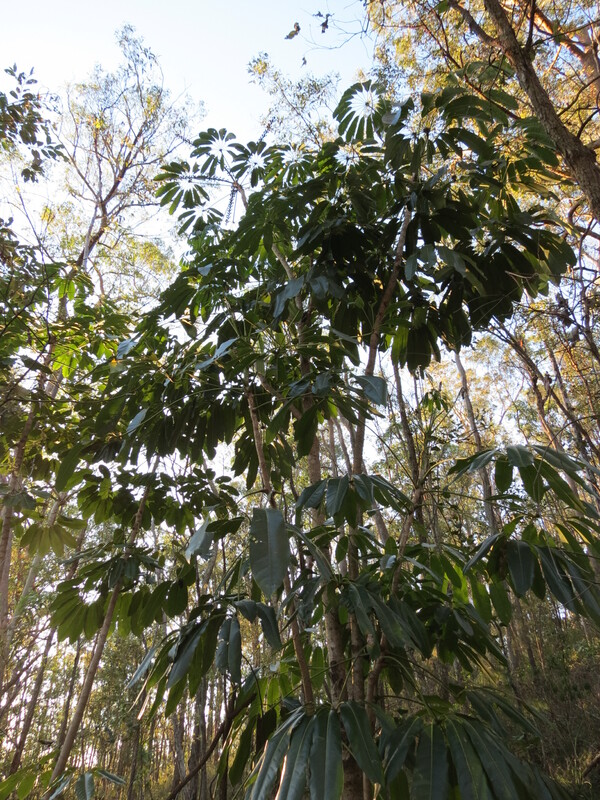 Umbrella Trees, from North Queensland, produce a large number of seeds which are spread from backyards to bushland or other backyards when eaten by birds. The cluster of over fifty small trees in a limited area shows how quickly these environmental weeds can spread and impact on the native plant species or invade a neighbour’s backyard. 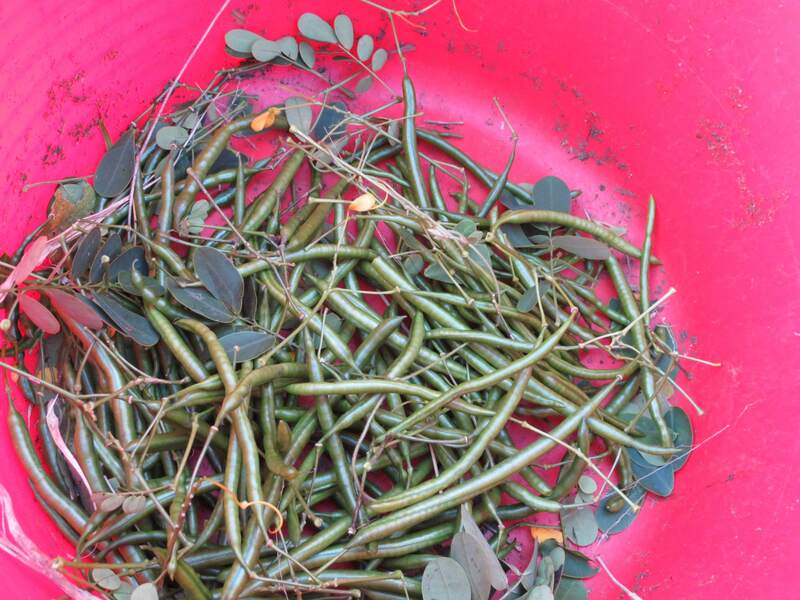 Seeds from the large trees were bagged for disposal offsite to reduce the risk of re-infection. 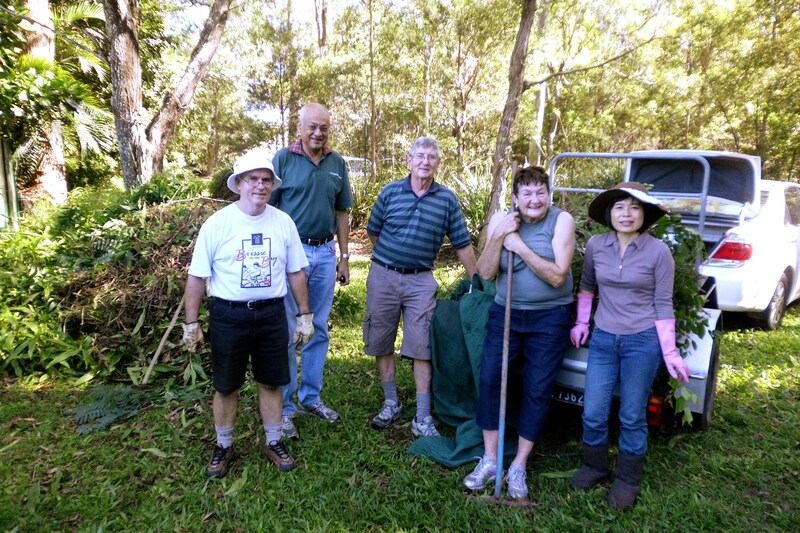 Weeds are one of the three key threats to the long term bio-diversity of Mt Gravatt Conservation Reserve. Most weed infections are caused by seeds spread by birds or wind, or result from dumping of garden waste including grass clippings in the bush. One of the most frustrating parts of our bush restoration work is dealing with restored areas re-infected with seeds dispersed from urban backyards. 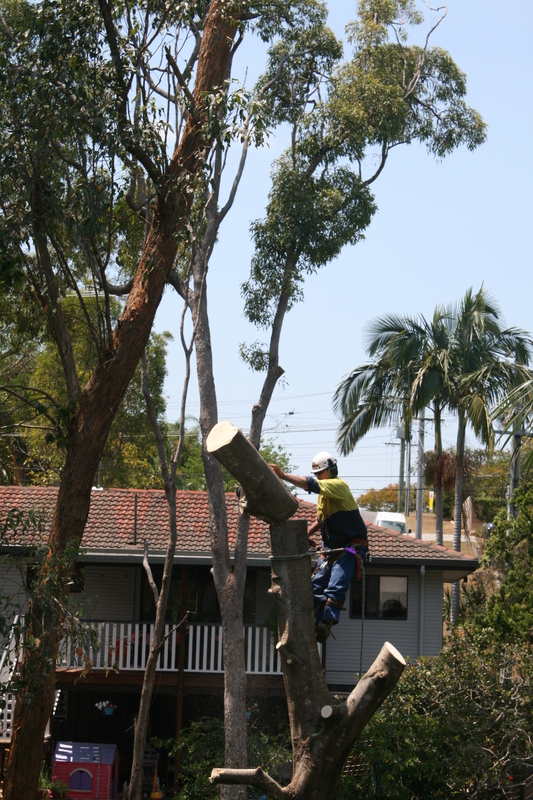 Bushcare groups across the city by removing the sources of infection from your backyard. Some weeds don’t come out easily so extreme measures are required. 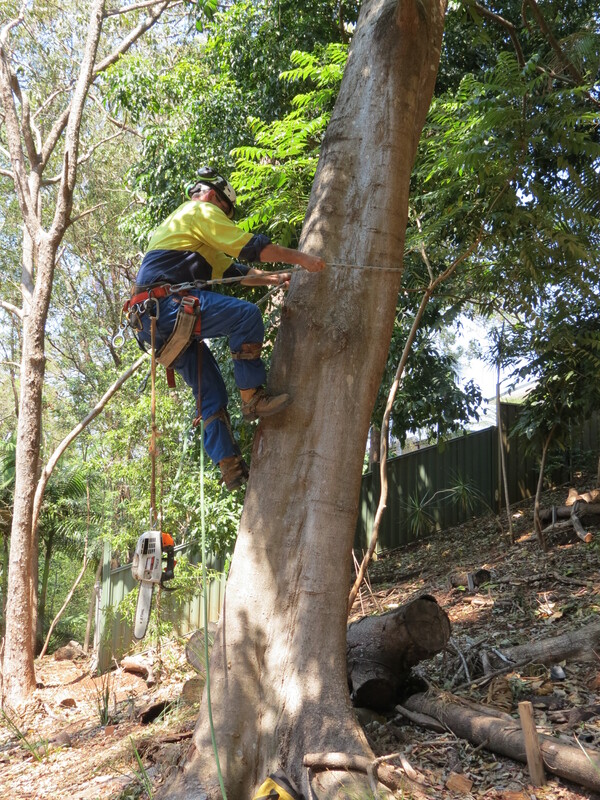 Dale, owner of Climb n Grind, straps on his spikes to scale this 20 metre high weed, an invasive Chinese Elm Celtis sinensis. 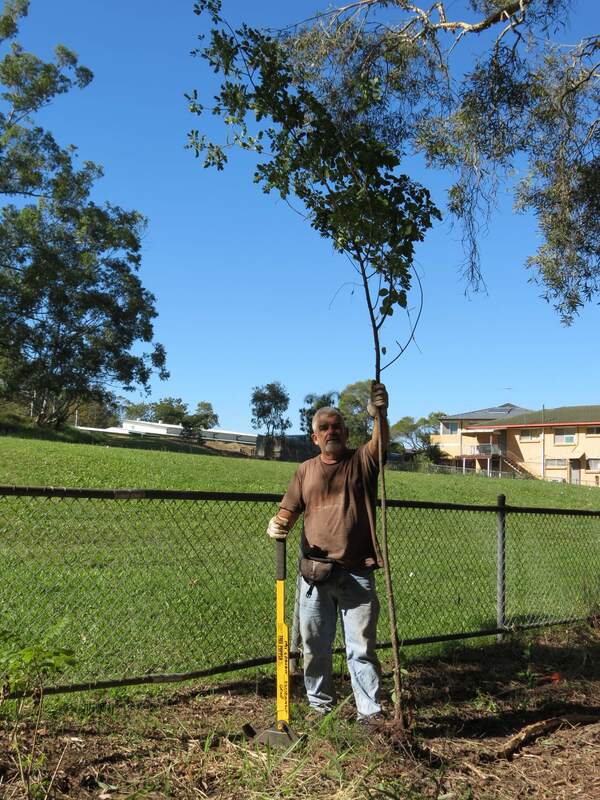 Sales of Chinese Elms have been prohibited for some years however this fast growing invasive weed is still growing in many backyards and spreading to neighbouring backyards as well as bushland areas like Mt Gravatt Conservation Reserve. 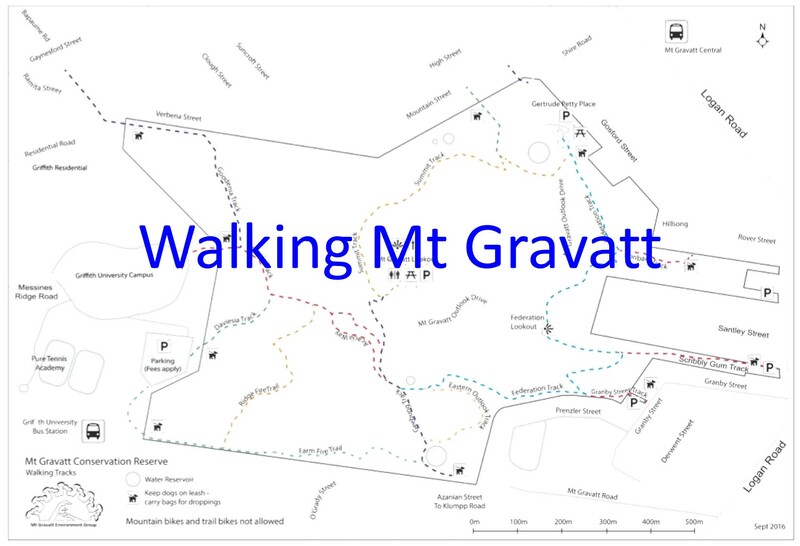 In 2012 Mt Gravatt Environment Group has been working closely with BCC Habitat Brisbane Officers to remove large Chinese Elms within the Conservation Reserve. 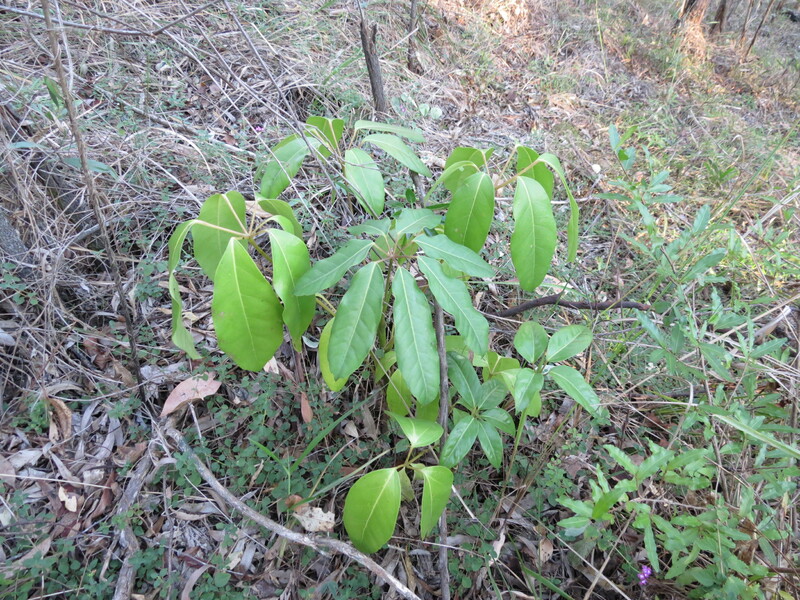 Invasive weeds are one of the three key threats to the long term health of this unique Koala habitat. So it is inspiring to work with community members committed to restoration of the Fox Gully wildlife corridor and paying for removal of these weeds on their own properties. In this case Annette has contracted professional tree climber Dale to scale the tree and to deconstruct it without damage to surrounding building or fences and with minimal damage to the restoration planting. Watching Dale operate was amazing. 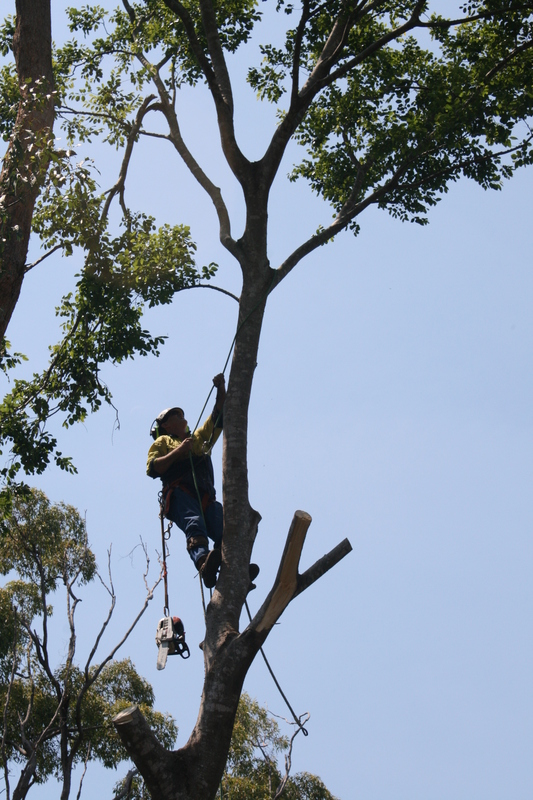 Having strapped on spikes and hanging an extraordinary collection of ropes, tools, even a chainsaw, from his belt Dale simply started “walking” up the side of this tree, making it look as easy as stroll in the bush. Towering above surrounding houses this Chinese Elm was significantly more than the 12 metre height mentioned in the DPI document. 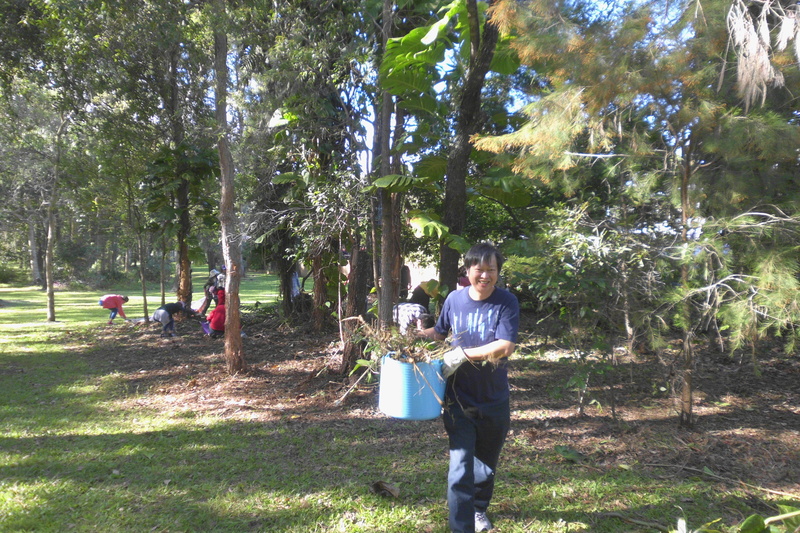 The stump of the huge Indian Rubber Tree removed in 2011 can be seen in the background and way below the branch where Dale is so casually standing. Ok we’ve cleared the low branches so it’s time to climb again. Note the fork that was above and to the left of Dale in the last picture is now below him! That fork is now far below as Dale climbs higher to do a little light pruning. 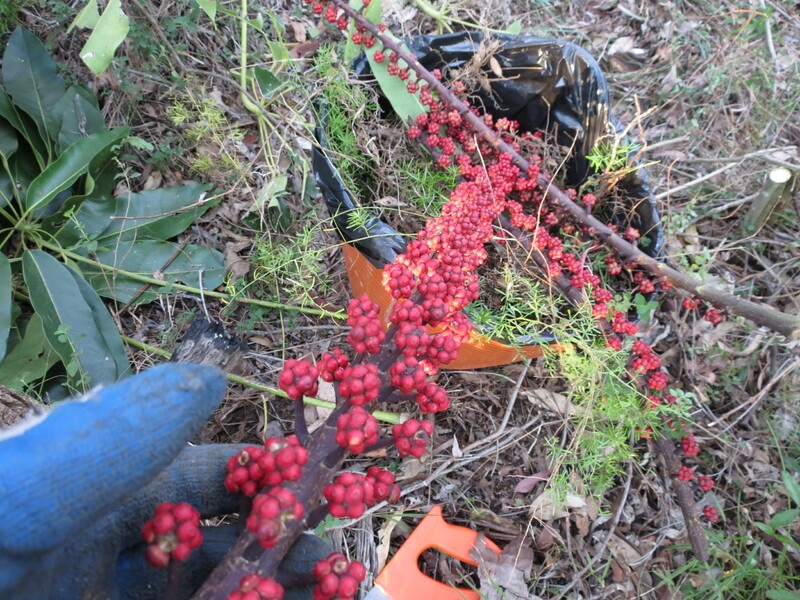 The tree was covered in hundreds or perhaps thousands of immature berries that would have been spread by birds or washed down the gully to infect other properties or Roly Chapman Reserve and Mimosa Creek. 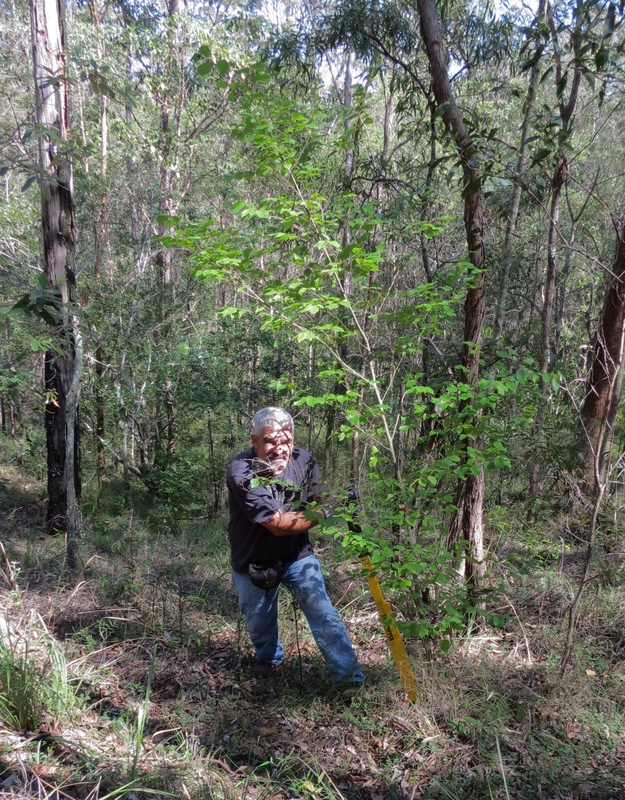 Prior to targeting Chinese Elms for removal we would remove two or three hundred seedlings each year in each of our bushcare sites so removal of this tree is a significant boost to our restoration efforts. Lions’ refurbishment of the Roly Chapman Reserve native gardens is steaming ahead. 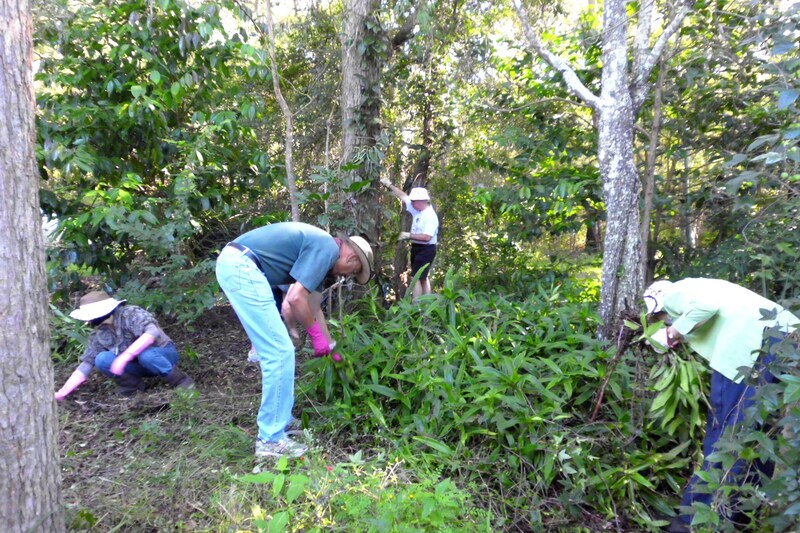 A thick jungle of garden escapees, including Purple Succulent Callisia fragrans, Corky Passion Vine Passiflora suberosa, Chinese Elm Celtis sinensis, Cobblers Pegs Bidens pilosa and Cocos Palms Syagrus romanizoffiana, confronted the volunteers when they arrived. The Cobblers Pegs were over a metre high and covered in seeds, requiring careful removal. The Purple Succulent also required careful handling to ensure all fleshy stems and roots were lifted, or they’d resprout. Baska and Kevin hit on the idea of using a small tarp onto which the weeds were loaded, and then lifted off the beds. Meanwhile, the rest of the crew were kept busy pulling weeds for removal. Perfect weather, plus a great team produced an excellent morning’s work. Well done, MacGregor Lions and neighbour Liz! Meet on the concrete pathway at the third garden from Hoad Street end. For details: email – Macgregor.Lions.Secretary@gmail.com or contact John Spriggs on 3849 6479. 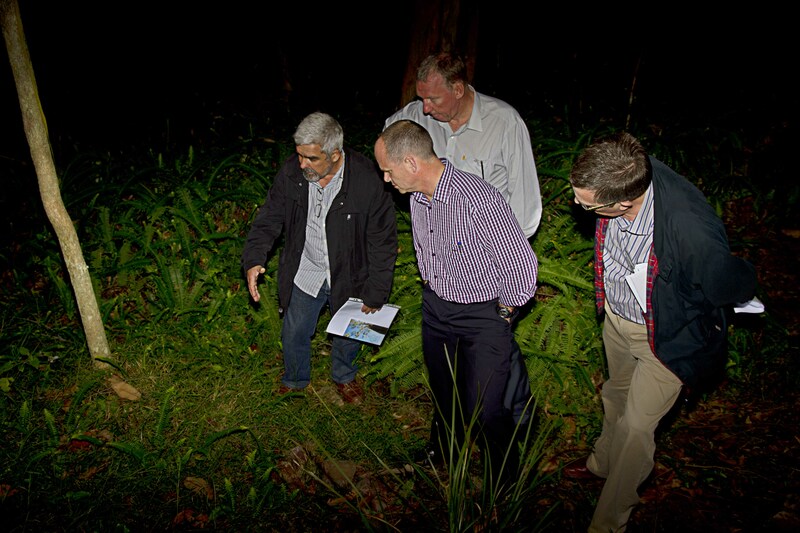 We were honoured to host local LNP candidate Ian Walker with Campbell Newman and Jeff Seeney at our Fox Gully Bushcare site yesterday. Late in day and the light was fading however our visitors were still keen get out into the bush and see our restoration work. 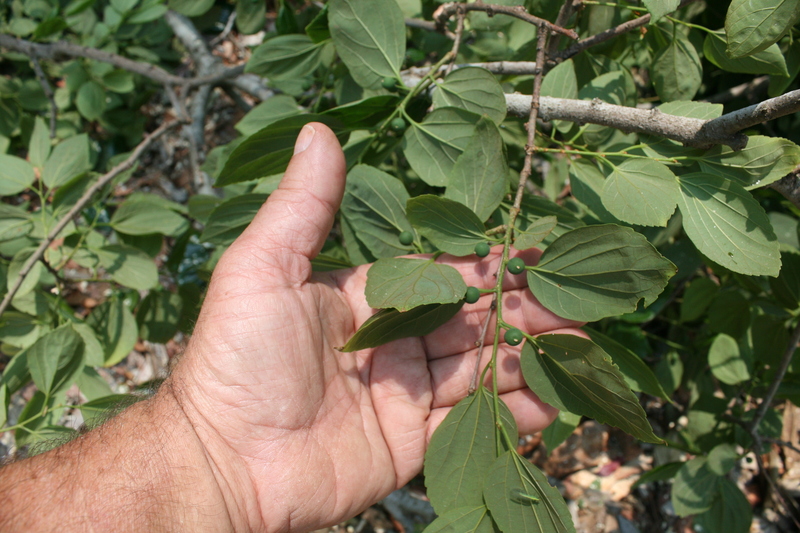 Campbell was particularly impressed with the elegant design of the Treepopper we use to remove difficult weed trees like Chinese Elm Celtis sinensis and Micky Mouse Plant Ochna serrulata. 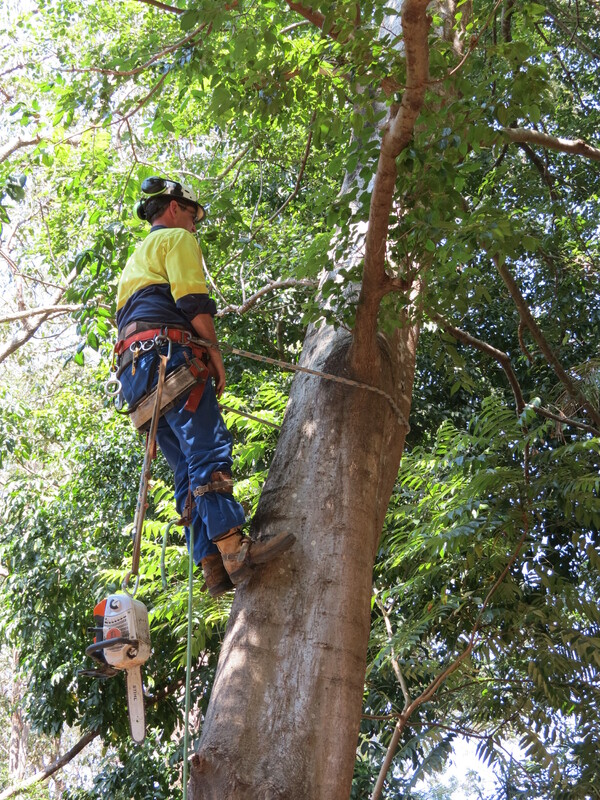 Specialist tools like the Treepopper dramatically increase productivity of our bushcare team allowing us to start getting ahead of these invasive weeds. Jeff Seeney, with his Landcare experience, was particularly interested in our focus on natural regeneration. I was happy to show how, in less than twelve months, native Graceful Grass Ottochloa gracillima has returned to act as Green Mulch in the area cleared of Fishbone Fern Nephrolepis cordifolia. 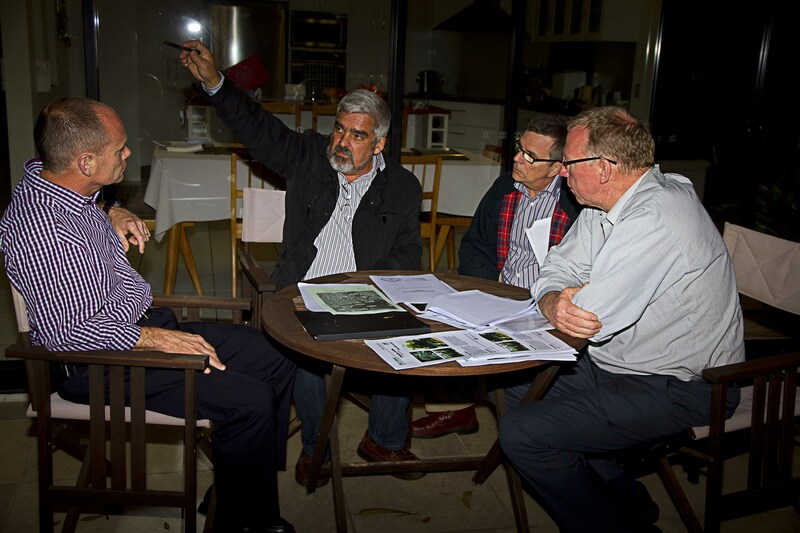 My thanks to Ian Walker for the opportunity to present our community initiative and Alan Moore, a Fox Gully Bushcare volunteer, who tackled to fading light to provide our excellent photos.